It’s an abbreviation of ‘Wellington Boot’, a term used for reasons I can’t remember (but Mark’s provided a link to a Wikipedia article that includes a delightful section on ‘Wellingtons in sport and song’). Those below were seen on a damp day at the Greenbelt festival. Mine, sadly, are just plain and boring. I remember Wellies well, but since moving to San Diego we haven’t had much call for them. 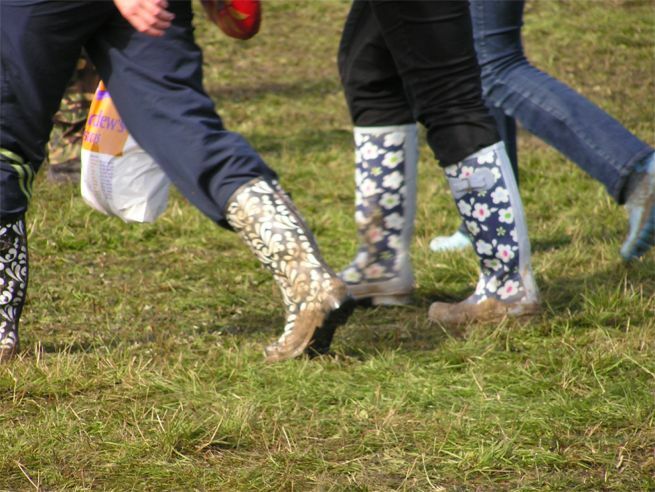 This article might clarify the origin of Wellies. Although I must confess that I’m mystified by “grizzling”, that seems more the domain of men who haven’t shaved in a few days, or bears — for which some men are occaissionally mistaken. Grizzling? It’s what my mother used to call the noise a baby makes as warning of imminent serious crying if something isn’t done very soon. On the other hand, it’s sometimes the grumbling prelude to dropping off to sleep… The trick is to be able to tell the difference. There definitely aren’t any bears involved, although in our house an unshaven man was known to lift his head from the pillow and ask sleepily, ‘What does he want?’ as if I was likely to know the answer. Thanks for the Wikipedia link, Mark – for some reason WordPress has edited it out of the comment so I’ll put it in the post. They’ll be Gummistövlar in our house from now on. Thank you all for the education. I have learned about Wellies and I have received yet another in a long line of lessons in humility. Seems like a guy should have known at least some of that fascinating stuff in the Wikipedia article. Well. In the musical My Fair Lady, Professor Higgens sings a grand song of lament of how the English speak english and during the song slips in the acute observation “Why in America, they haven’t spoken it in years”. Hard to argue with that. Thanks for raising the question, Phil. Interesting how language evolves – I went to an exhibition of medieval writing last night (at the King’s College Library in Chancery Lane, in case anyone nearer than Oregon reads this and fancies a look).